With Yoeli Childs back and Nick Emery soon to return, BYU is aiming for a return to the NCAA tournament — but beware that schedule. (Trent Nelson | The Salt Lake Tribune) Brigham Young Cougars guard Nick Emery (4) looks to pass as BYU hosts Weber State, NCAA basketball at the Marriott Center in Provo, Wednesday December 7, 2016. Provo • After West Coast Conference basketball officials trimmed the league schedule and made some other changes last spring to keep Gonzaga from bolting to the Mountain West, BYU basketball coach Dave Rose and his staff added a couple more difficult games to an already challenging non-conference schedule in hopes of impressing the NCAA tournament selection committee. Now comes the hard part. The Cougars have to win the majority of those games to get back to the Big Dance for the first time since the 2014-15 season. “That’s the plan,” said Rose, who enters the 14th season of his head coaching career with a relatively experienced team centered around junior forward Yoeli Childs, a WCC Player of the Year candidate. The coach saw what happened to Saint Mary’s last spring after the Gaels won 30 games but were left out of the NCAA tournament, and vowed to upgrade his non-conference schedule, even if it meant “biting the bullet” and playing some games on the road without the guarantee of a return game at the Marriott Center. The Cougars open the 2018-19 season with one of those uber-challenging games on Tuesday, facing No. 7 Nevada at the Lawlor Events Center in Reno. They will play three other Mountain West Conference foes — Utah State, UNLV and San Diego State — and added a road trip to No. 17 Mississippi State with one of the openings created by the WCC scheduling change. The Cougars will succeed if: They can shoot the basketball well, especially from long range and the free-throw line. Poor 3-point shooting was a big problem last year for almost every player but Elijah Bryant, who has turned professional, and it hasn’t been good in the intrasquad scrimmage and two preseason exhibition games. The Cougars won’t succeed if: Their return to a faster offensive pace causes them to forget how to play defense as in years past. The program improved defensively last season with assistant coach Heath Schroyer bringing more focus to that aspect of the game, but he’s now the head coach at McNeese State. Bottom Line: Nobody in the WCC is going to overcome No. 3-ranked Gonzaga for the league championship, so the Cougars need to win most, if not all, of their non-conference games and avoid the usual two or three letdowns in conference play against the lower tier teams in the league. Childs, who tested the NBA draft waters last spring before deciding to return for what quite likely will be his final year in Provo, said making the NCAA tournament after a three-year absence “is the ultimate goal above anything else” this season. The Cougars lost leading scorer Elijah Bryant, now playing professionally in Israel, off a team that went 24-11 last year and fell to Stanford in the first round of the NIT. But six players with starting experience return, most notably Childs, junior guard TJ Haws, senior center Luke Worthington, junior sharpshooter Zac Seljaas and junior point guard Jahshire Hardnett. Those five started in both exhibition games. Junior forward Dalton Nixon has been the first player off the bench and adds versatility and excellent defense. Another former starter, junior guard Nick Emery, has been reinstated by the NCAA after missing all of last season, but must sit out the first nine games and will return for the Dec. 5 home game against Utah State. Although 11 letter-winners return, three newcomers should have an immediate impact, judging by how they performed in the exhibition games. Freshman returned missionaries Gavin Baxter, Connor Harding and Kolby Lee are all ready to contribute, Rose and Childs said recently. 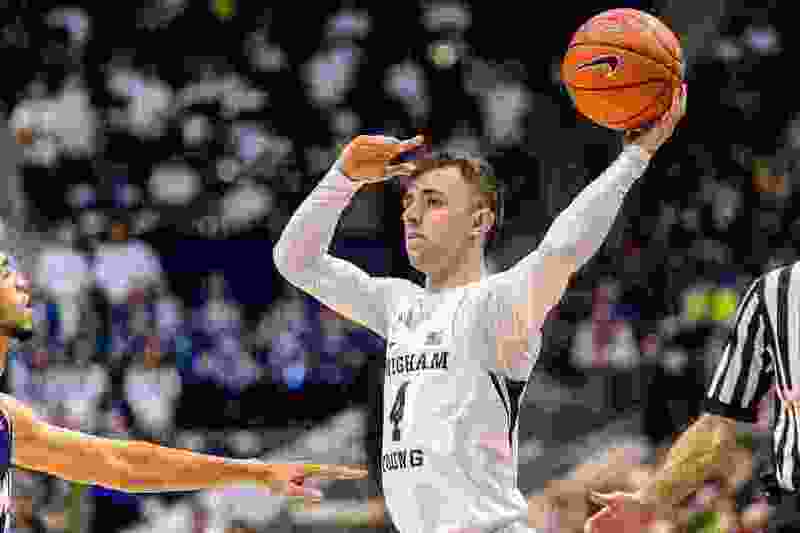 Baxter and Lee, both listed at 6-foot-9, will be needed right away because this will be one of the shortest BYU teams in recent memory after 6-10 junior Payton Dastrup transferred to Oregon State last summer. "We could play four guards a lot, much like we did a few years ago," Rose said. "Rebounding will be a big factor for us this season." Tuesday — at Nevada, 9 p.m.
Friday — Utah Valley, 8 p.m.
Nov. 13 — Northwestern State, 7 p.m.
Nov. 15 — Oral Roberts, 7 p.m.
Nov. 21 — Rice, 7 p.m.
Nov. 28 — at Illinois State, 6 p.m.
Dec. 1 — at Weber State, 7 p.m.
Dec. 5 — Utah State, 7 p.m.
Dec. 12 — Portland State, 7 p.m.
Dec. 15 — vs. UNLV at T-Mobile Arena, Las Vegas, 6:30 p.m.
Dec. 22 — at San Diego State, 5 p.m.
Jan. 3 — at Pacific, 9 p.m.
Jan. 5 — at Saint Mary’s, 9 p.m.
Jan. 10 — Portland, 7 p.m.
Jan. 12 — Santa Clara, 7 p.m.
Jan. 17 — at Pepperdine, 9 p.m.
Jan. 19 — at San Francisco, 9 p.m.
Jan. 24 — Saint Mary’s, 9 p.m.
Jan. 31 — Gonzaga, 9 p.m.
Feb. 2 — Loyola Marymount, 7 p.m.
Feb. 7 — at Portland, 9 p.m.
Feb. 9 — Pacific, 7 p.m.
Feb. 14 — at San Diego, 7 p.m.
Feb. 16 — at Loyola Marymount, 2 p.m.
Feb. 21 — San Francisco, 7 p.m.
Feb. 23 — at Gonzaga, 8 p.m.
March 2 — San Diego, 7 p.m.